The large, browned to perfection, glistening turkey is a monument that marks this hallowed occasion. It’s the centerpiece at the table. We circle it like wagons and glaze upon its roasted image with wonder, delight and torrid, tasty desire. The cook who prepared it must be a saint. Surely no sinner could create something so phenomenally divine. Ok stop right here. Let me be real for a minute. Sometimes it’s a chore and pure burden to cook the emblematic foul. The expectations that accompany this poundy poultry are heavy – pun absolutely intended. I’ve set the bar pretty high on the succulent scale and each year I exceed it. You see I am a briner. With the skill and execution of a master mixologist I concoct brines using an array of sweet and savory ingredients. It’s a lengthy process. I brine my bird in a large, insulated ice crest for 24 hours. When my efforts elicit the “wow factor” after the first bite, my work is done and oftentimes so am I.
I have to admit, there have been a handful of Thanksgivings when I wasn’t feeling the bird after all the painstaking effort I put into making it perfect. Or when I thought about what an undertaking it was and asked myself if I really wanted to go through the fuss of it all. If this happens to be the year that you aren’t feeling the bird or want to provide an alternative for those who aren’t feeling it either, I offer my lovely and simple Rosy Chicken Recipe. No it doesn’t have roses in it; it is marinated in a mixture that contains lots of fresh rosemary, fresh garlic and lemons. Do yourself a favor and use only an organic chicken for this recipe. It will pay big dividends in terms of flavor. This bird is sure to entice a turkey fan or two. So you are probably wondering, am I making a turkey this year or not? I am still on the fence, gazing into the barn yard. 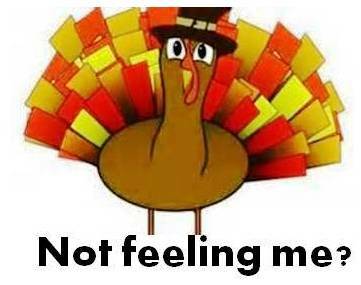 But seriously, whatever you make this Thanksgiving or bring to a Thanksgiving dinner (if you are not cooking) make it a wonderful time and bring lots of love and laughter with you. Lay the chicken with the breast side up on a cutting board. Cut through the breastbone of the chicken with a sharp knife or shears to separate the two halves of the chicken. Pull the two halves of the chicken open then cut completely through the backbone to separate the halves. Generous salt each half and place each half in a separate plastic zipper sealed bag. Squeeze lemons to obtain about 1/2 cup of juice. Add the juice to a mixing bowl along with olive oil, 1 teaspoon sea salt, ¼ teaspoon cracked pepper and chopped garlic. Whisk ingredients well. Pour mixture into each plastic zipper sealed bag, evenly distributing the mixture between the bags. Cut 12 to 16 slices of lemon and insert 6 to 8 slices in each bag, some on top of the chicken, some on the underside. 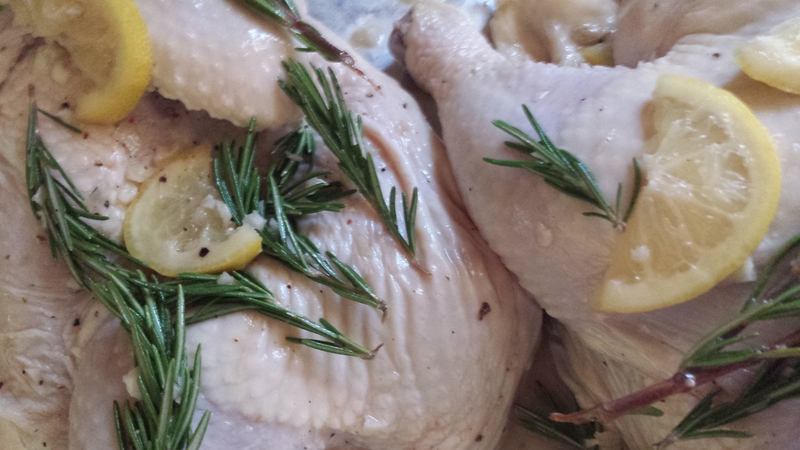 Insert 6 to 8 stalks of rosemary in each bag as well, some on top of the chicken, some on the underside. If the stalks are long, break them in half. Seal the bags well. Massage the bags to distribute the marinade all over the chicken. Place bags in the refrigerator for 2 to 4 hours. Massage marinade bags and turn them over a few times while in the refrigerator. Place each chicken half on a large baking sheet lined with non-stick foil. 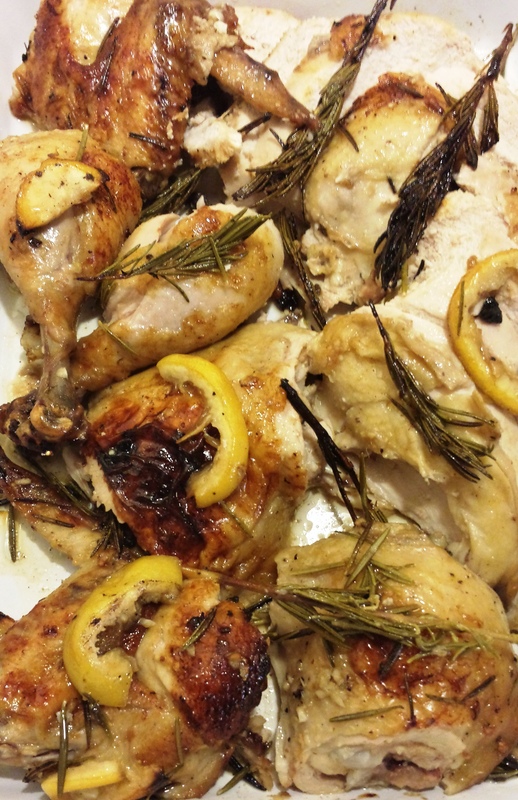 Place lemon slices and rosemary from marinade on top of chicken, and some underneath chicken. Pour remaining marinade on chicken. Cover loosely with fold. Place in oven heated 375° degrees Fahrenheit and bake 1 hour, basting frequently after the chicken has been roasting 30 minutes. Remove foil after an hour and bake another 30 minutes until golden brown, basting frequently. Remove from the oven let cool a little before cutting. Place chicken pieces on a serving platter. Garnish with the lovely roasted rosemary and lemon used in baking. This entry was posted in Foodies and tagged bird, brine, caviar, centerpiece, chicken, collard greens, Comfort Food, cooking, cracked pepper, foul, garlic, holiday season, holidays, lemon, marinade, mashed potatoes, olive oil, organic, organic chicken, poultry, rosemary, sea salt, Thanksgiving, turkey, ziplock bags. Bookmark the permalink.